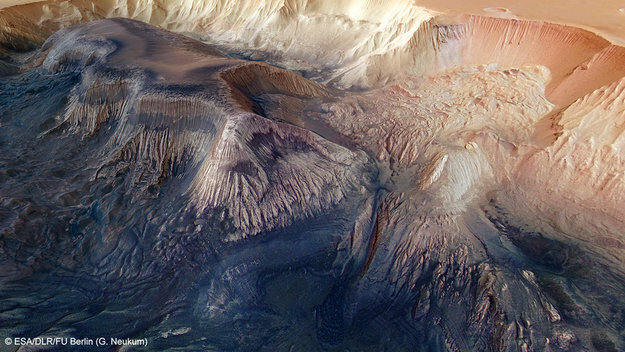 Ripped apart by tectonic forces, Hebes Chasma and its neighboring network of canyons bear the scars of the Red Planet’s early history. ESA’s Mars Express has flown over this region of Mars on numerous occasions, but this new eight-image mosaic reveals Hebes Chasma in full and in greater detail than ever. 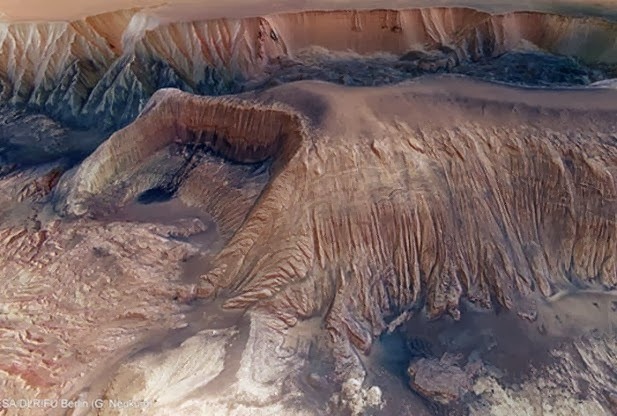 Hebes Chasma is an enclosed, almost 8 km-deep trough stretching 315 km in an east–west direction and 125 km from north to south at its widest point. It sits about 300 km north of the vast Valles Marineris canyon complex. 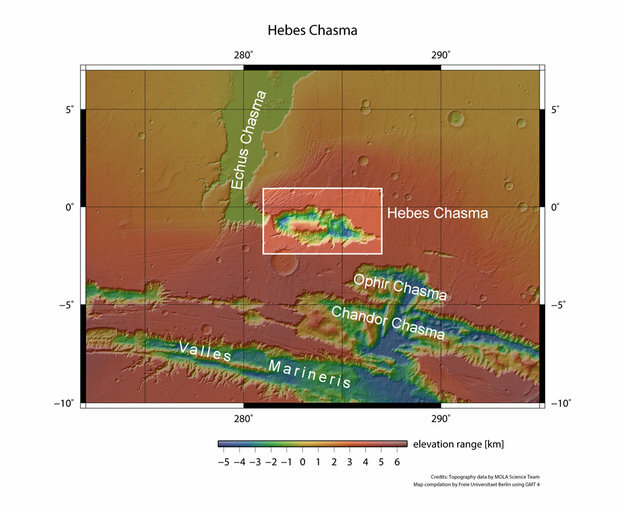 The origin of Hebes Chasma and neighboring canyons is associated with the nearby volcanic Tharsis Region, home to the largest volcano in the Solar System, Olympus Mons. As the Tharsis bulge swelled with magma during the planet’s first billion years, the surrounding crust was stretched, eventually ripping apart and collapsing into gigantic troughs, including Hebes Chasma. Intricate fault patterns can be seen all around the deep depression – they are especially evident in the main color and 3D images. In the center of Hebes Chasma, there is a flat-topped ‘mesa’ that rises to level similar to that of the surrounding plains. No other canyon on Mars has a similar feature and its origin is not entirely clear. Its layers include volcanic materials – just like in the main canyon walls – but also wind-blow dust and lake sediments that were laid down over time. A horseshoe-shaped chunk has been taken out of one side of the mesa, seen below, where material has slumped down onto the valley floor below. A landslide may also be responsible for the dark patch in this image, which appears to pool like spilt ink across the debris. It is most likely loose dust that has slid down the walls, perhaps helped along where melting ice or ground-water weakened the rocks to create a flow-like feature. A similar feature is visible at the opposite end of the mound. Other landslide deposits are seen all over the floor of Hebes Chasma, many coming from the main canyon walls. Numerous grooves are etched into both the canyon walls and the mesa, suggesting the material is weak and easily eroded. In a second perspective view, a thin band of darker material is seen between two layers of light material. One idea is that the material was blown or slid from the top of the mound and collected on the slopes below. Dark material is also seen around the base of the mesa, which either eroded away from the younger sediment layers located higher up in the mesa, or were deposited separately by wind or water. Other layers revealed in the sides of the mesa may also have been deposited by water. Data from both Mars Express and NASA’s Mars Reconnaissance Orbiter reveal that some parts of Hebes Chasma are laced with minerals that can form only in the presence of water, suggesting that at some point in the Red Planet’s history the canyon might have been filled with a lake. However, it is apparent from the chaotic debris that fills the canyon floor that enormous landslides have also played a key role in shaping and widening this deep scar since its formation.